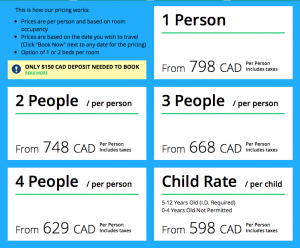 New York City New Years Celebration Tour - Comfort Tour Canada - Fully-Escorted Bus Tours in Canada, USA and Europe! 7:00 – 9:00 AM Board the coach at your chosen pick-up location (pick-up times vary) and travel to Niagara Falls Canada/U.S. border (proper documents required subject to U.S. entry laws). 10:00 – 11:00 AM Border crossing and coffee break to follow. 1:00 – 1:30 PM Stop for lunch en route (cost of lunch is not included). Then, continue to travel through the beautiful landscapes of New York State towards your hotel accommodations. 4:00 – 5:00 PM Stop for dinner en route (cost of dinner is not included). 8:00 PM Approximate arrival time at your luxury hotel located in New Jersey, a short distance from Manhattan. Enjoy the evening at your leisure. 6:30 – 7:45 AM Buffet breakfast at the hotel (included). Bus leaves the hotel at 8:00 AM. 9:00 AM – 3:00 PM Enjoy a fully-guided Midtown Manhattan Tour with your local New York City guide. Tour is a combination of bus and walking. All points of interest with admission are to be visited during your free time. Gratuities to your city tour guide are optional and at your discretion. 3:00 PM – 8:00 PM Drop-off in central Manhattan for free time. “TKTS Discount Booths” in Manhattan offer tickets to Broadway and Off-Broadway musicals and plays at up to 50% off! Museums – The Metropolitan Museum of Art, Guggenheim Museum, Museum of Modern Art (MoMA), etc. 8:00 PM SHARP Pick-up – Bryant park at 6th Av and 40th street and return to your New Jersey hotel. You may stay longer in Manhattan for the nightlife; however, you must arrange your own transportation back to the hotel. New Jersey Transit trains run until 1:30 AM from Penn Station (near Macy’s) to a station located 2 blocks from the hotel. Comfort Tour will not be responsible for any admission tickets purchased in advance in the event of a canceled tour. 8:00 AM Depart hotel for Statue Cruise with stops at Liberty and Ellis Islands (Extra fee: $15 U.S/adult +). *Please note that your cruise does not include access to the Statue of Liberty pedestal or crown. 1:00 PM Drop-off for lunch, followed by free time in Manhattan. The bus will offer several drop-offs in Manhattan after your cruise. 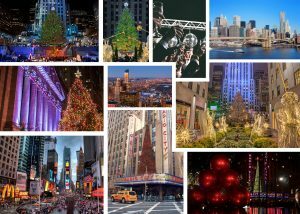 Stay in Manhattan for New Years Celebration, Times Square New Years eve ball drop and travel back to the hotel on your own. – You may take a New Jersey transit train from Penn Station (near Macy’s) back to the New Brunswick station located 2 blocks from your hotel. Trains will run until 1:30 AM. More information will be provided to you by your tour director on the bus. You may also research the train schedule on your own at www.njtransit.com/. 5:00 PM SHARP Pick-up – Bryant park at 6th Av and 40th street and return to your New Jersey hotel. If you wish to stay behind, you must find your own transportation back to the hotel. 6:30 – 7:45 AM Buffet breakfast at the hotel (included), followed by hotel check-out. 8:00 AM Departure from your New Jersey hotel for Toronto via scenic routes. 11:00 AM Coffee and restroom break en route. 2:00 – 4:00 PM Stop at Waterloo Premium Outlets in Waterloo, NY for lunch and shopping. 8:30 – 9:30 PM Expected arrival time at your drop-off location (same as your selected pick-up location). Gratuities to your tour director are optional and at your discretion. This is a luxury hotel in the heart of downtown New Brunswick, New Jersey and surrounded by restaurants, bars and shops, 2 blocks from New Brunswick train station.